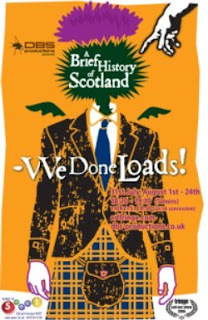 A Brief History of Scotland – We Done Loads! A fifty-minute re-imagining of Scotland’s history -- sounds like just the thing for three Kiwis calling Edinburgh home. We’ll feel good when we get the in-jokes, and learn something when we don’t, right? Well, that was the reasoning. The star of the show is undoubtedly God, also known as Sean Connery. Maximum laughs are extracted from this confluence throughout the show, but ultimately, the reliance on an invisible omniscient presence means the non-divine actors spend a lot of time standing on stage with contorted faces while the voice over plays. Most of the sketches seemed to go down better with the Scots among the audience than the interlopers. It’s not that I didn’t get what they were driving at (except the thing about cannibalism, that went right over my head), the humour just didn’t seem that funny. Perhaps it’s a culture thing. Or perhaps there were a lot of friends and family of the crew in the audience? Occasionally the show managed to get it just right -- the heavily Australian-accented William Wallace, the ‘Choose Fife’ send up of Trainspotting (though it was delivered at such breakneck speed I only caught half the lines) -- but too many sketches dragged and too many hammy lines were delivered with half-hearts for me to be caught up in the half-ironic patriotism of the ending. The venue is small (a meeting room in the Apex Hotel) but it’s the Fringe - - you can’t expect a city of half a million people to have 350 theatres. It’s part of the charm - - seeing things you might not normally in places you wouldn’t expect. But yeah, I’m glad I went to this show today when tickets were half price.